It’s almost Pavlovian: Hollywood announces a remake (or reboot: the new lingo would have us think of film as technological products rather than artworks), and cultists sharpen their pitchforks, oil the torches, and storm Sunset Boulevard. But let’s be honest, shall we? Unbridled creativity, averse to anything but wholly original novelty, would quickly bankrupt the studios. Balancing the need to offer something new while drawing on proven successes to justify the economic investment makes it pointless to get upset when old favourites are remade. Instead, it might be less apoplectic to view remakes like musical compositions that offer variations on a theme. If you don’t like a variation, you can always go back to the original. Call me an optimist, but I’d argue that Hollywood remakes offer new generations of filmmakers the opportunity to revisit ideas from a new perspective. 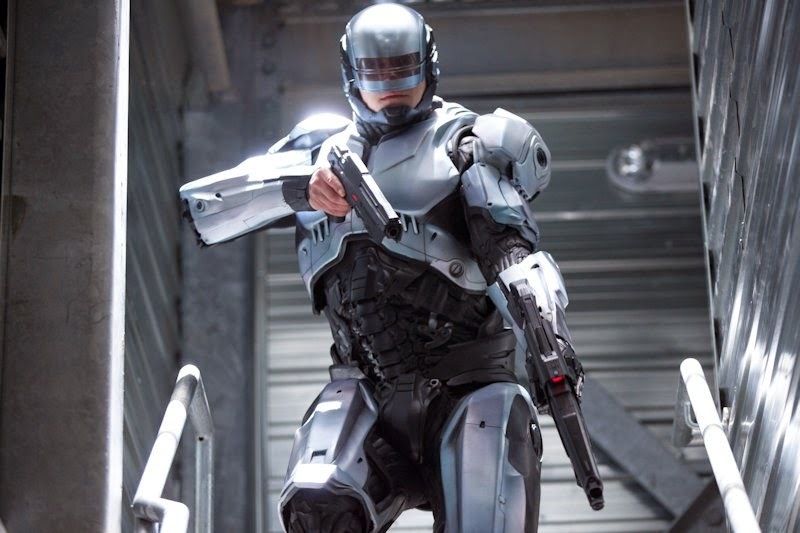 Some fail, but others, like Jose Padilha’s updated take on Robocop, succeed. Still, cheap and exploitative as it may be, exploding heads offer easier thrills than talking heads. Verhoeven’s film hews closer to the action movie formula, resulting in a film with undeniable momentum from beginning to end. By comparison, Padilha’s Robocop (scripted by Ed Neumeier , Michael Miner , Josh Zetumer, and Nick Schenk) is rather drowsy, livened up by a few action set pieces but mostly a cerebral affair. Far from being a critique of Padilha’s approach, however, the departure from action movie bombast requires a change in expectations. This new Robocop is not an 80s action film, or an attempt to approximate one, but rather a rare beast in the Hollywood menagerie: a thoughtful science-fiction film that is well-filmed, well-acted, and well-conceived, if a bit undercooked at times. Rooted in the politics of drone warfare and the militarization of law enforcement, Padilha strives to offer a parable on the dehumanizing effects of wars waged by proxy, first by actual machines and, inevitably, via cyborg. An opening scene of pacified Tehran, in which citizens are subject to law enforcement by robots, sets the baseline. Puncturing American hypocrisy, the film deploys Samuel L. Jackson as a reactionary television personality to rail against the rejection of mega-corporation OCP’s law enforcement drones within the US while supporting their use abroad. Then OCP’s CEO Raymond Sellars, played with carefully calculated understatement by Michael Keaton, delivers the grand idea to exploit American fears for market share: restore the ghost in the machine, put a human spin on the robot. The absence of graphic violence serves to highlight, not undermine, the overall commentary on sanitized violence. After all, what is drone warfare if not the cognitive dissonance of damaging an opponent without risking casualties of one’s own? An early training scene sees Robocop, complete with a sophisticated head’s-up display, gracefully dispatch robot drones in a sequence that recalls a video game. That scene is later repeated with the same clinical detachment, only with a warehouse full of live people. The parallel is striking; violence as video game, insulating the player/soldier from a visceral reality that might otherwise cause a crisis in conscience. Particularly refreshing in the film’s speculative sci-fi is Gary Oldman’s as Dr. Norton, the scientist behind Murphy’s reconstruction. The trope would have presented him as an amoral eccentric, a willing puppet to anyone able to bankroll an obsession with going over the edge. Yet in Padilha’s vision, delivered with Oldman’s customary nuance, Dr. Norton is a conscientious man who carefully considers the implications of his work – and suffers a moral crisis as a result. This is just the sort of awareness that imbues Padilha’s revisioning of Robocop with intelligence and a sense of purpose. Where most reboots, notably film adaptation of vintage TV series, have failed on account of missing the essence of its inspiration, Padilha’s Robocop takes the core concept of Verhoeven’s film and offers enough new ideas to escape its shadow and validate the remake as a legitimate Hollywood effort.